Historically, the identity and name of the Khmer-Krom people and their ancestral lands have been changed and/or referred to differently by various civilizations as well as the colonizing governments. Under the colonization of France, Kampuchea-Krom was called Cochin China. The terms Khmer, Khmer-Krom, Vietnamese of Khmer Origin, Khmer Nam Bo, and Cambodian are used interchangeably when referring to people of Funan descendent (see table below). Archeological evacuations conducted by French archaeologist Louis Malleret, of the Ecole Francaise d’Extreme-Oriente (EFEO), found the site of a city named O-Keo (Oc-Eo), which provides evidence that the Khmer civilization lived in 1st century B.C., or during the Nokor Phnom (Funan Kingdom) period. Chenla is the Chinese translation for the ancient term of Kambuja meaning Cambodia. Aided by its similarities in cultural identity and customs, Funan was successfully integrated into Chenla under the rule of King Mahendravarman, brother of King Bhavavarman and then by King Isanavarman. During the reign of the King Isanavarman, Chenla’s capital was established at Isanapura, in the ruins of Sambor Prei Kuk of modern Cambodia. While Western and Chinese historians have often referred to Chenla as the first Khmer kingdom, Khmer sources claim that Kampuchea-Krom or Funan is actually Cambodia’s first state. This is especially true with the recent suggestion that the Funan people are indeed the Khmers. Inscriptions of early Khmer writing as well as Sanskrit language found in brick stones and Hindu temples across Kampuchea-Krom and mainland Cambodia during this era suggest adaptation and integration of the native language with the Sanskrit language. In 802, a new period of Cambodia emerged, now widely known as the Angkor Period. Derived from the Sanskrit word “nagara” meaning “city”, Angkor became an empire. On the claim that he was a descendant of Funan, Jayavarman II was crowned and began the process of uniting Lower Chenla (Kampuchea-Krom), starting at the capital of Aninditapura. He then progressed northwest, taking control of Indrapura (on the lower Mekong River on the east of Kampong Cham). The capital of Hariharalaya (southeast of Siem Reap) became Jayavarman II’s permanent destination, a site in which he then started to expand his influence across South East Asia. In Kampuchea-Krom, the statues of Shiva, Vishnu and Buddha made of Bronze have been recovered by French archaeologists at Wat Bodhisiri in Kampong Spean (renamed Cau Ke district) in the province of Prek Reussey (CanTho) as well as other temples across the Mekong Delta region. In 1306, the Cham King Jaya Simhavarman III (Che Man) married the Vietnamese princess, Huyen Tran. In the exchange of this marriage, the Cham King agreed to give two provinces in the north of Champa to the Vietnamese King. This political marriage did not last longer than a year because the Cham King was killed by suspicious means. The Vietnamese princess ran away with the Vietnamese general, Tran Khac Chung, to the Vietnamese Capital (Thang Long). In 1471, the Vietnamese army under the leadership of Emperor Le Thanh Tong started invading Champa. The Cham king Pau Kubah (Tra Toan) was captured. The northern part of Vijaya (Qui Nhon) felt under the control of the Vietnamese. 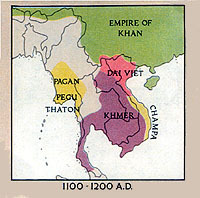 The southern part of Champa was still under the control of the modern Cham Lords in the principality of Panduranga (Phan Rang, Phan Ri and Phan Thiet). In 1497, The Vietnamese Emperor Le Thanh Tong died and Vietnam started falling into a civil war between Le/Trinh and Mac dynasties. Nguyen Hoang feared that one day, Trinh Lord (Trinh Kiem) who was his brother in-law, would kill him, his older brother. Thus, in 1558, Nguyen Hoang asked permission from the Trinh lord to govern the southern provinces where the Vietnamese took over from the Champa kingdom. Trinh Lord agreed right away because he believed that Nguyen Hoang would not have the chance to compete for power with him. While the Trinh lord carried out the war against the Mac dynasty in the North, Nguyen Hoang started building up forces to defend him if Trinh Lord attacked from the North and also started implementing the southward strategy “Nam Tien” to keep encroaching on Champa lands. With the pressure from the North by the Trinh Lord and constant attacks from the South by Champa in efforts to reclaim its land, the Nguyen Lord tactically presented his daughter, Princess Ngoc Van, to the King Chey Chetha II in 1620. At that time, King Chey Chettha was 42 years old and already married. King Chey Chettha accepted the offering from Nguyen Lord to build a relationship of mutual interest between Cambodia and Nguyen Lord. King Chey Chettha thought that with his relationship with Nguyen Lord, Siam would give up their influence and encroachment on Cambodia territory. Unfortunately, he did not know that his political marriage with the Vietnamese princess started to fall into the Nguyen Lord’s strategy called the “March to the South”. In 1623, aided by Queen Ngoc Van’s intervention, the Nguyen warlord sent Vietnamese delegates to ask the Court of Udong to grant permission for the Vietnamese people to conduct trade in Preah Sourkea (Baria), Prei Nokor (Sai Gon), and Chonva Tropeang (Bien Hoa) provinces. Obliged through his marriage, King Chey Chettha II gave trade permission and allowed the Vietnamese people temporary settlement in those provinces. This was the first time that the Vietnamese obtained a foothold in Kampuchea-Krom and began their ambitious expansion plans toward the South in which the Kingdom of Champa became their first target. In 1627, the Trinh Lord (Trinh Trang) from the North started attacking the Nguyen Lord because the Nguyen Lord refused to obey the Trinh Lord. The Trinh-Nguyen war started from that year. In 1628, King Chey Chettha II died at 58 years old and his oldest son, Ponhea To, was ordained as a Buddhist monk. Chey Chettha’s younger brother, Preah Ottey, refused to be crowned King, but he agreed to manage the country until Ponhea To finished his monkhood. In 1629, Ponhea To finished his monkhood and became a Cambodian King until 1634. His second brother, Ponhea Nu, succeeded him as Cambodian King and died in 1639. In 1658, after failing to overthrow Cambodian King Ang Chan, Ang So (son of Preah Ottey) went into hiding under the protection of Chey Chettha II’s wife, Vietnamese Queen Ngoc Van. Queen Ngoc Van told Ang So to seek help from Nguyen Lord. With the ambition to invade Cambodia, the Nguyen Lord quickly agreed to send the Vietnamese troops to help Ang So. King Ang Chan was captured along with his armed forces during the fighting against the Vietnamese at Preah Sourkea (Ba Ria) and imprisoned in Quang Binh (near Tonkin border) and died there in 1659. In this war, Ang Em who was a brother of Ang So, was also killed in the fighting in Barach river. Nguyen Lord installed Ang So as Cambodian King and he reigned until 1672. During the reign of Ang So, under the influence of the Nguyen Lord and assisted with the interference Queen Ngoc Van on the Cambodia court, the Nguyen Lord started sending the Vietnamese to live in Prey Nokor, Preah Sourkea, and surrounding area. The Nguyen Lord used the strategy “Dân Đi Trước, Làng Nước Đi Sau” which simply means “Send the Vietnamese to live there first, and then start conquering the area later.” Because the culture and language between the Vietnamese and the Khmer-Krom are different, wherever the Vietnamese moved in, the Khmer-Krom started moving away from that area. In 1816, with the ambition to tactically legalize Kampuchea-Krom as Vietnam’s territory, the Emperor Gia Long ordered Thoai Ngoc Hau to arrest the Khmer-Krom to dig the “Vinh Te” canal, which runs for about twenty five miles between the Gulf of Siam and Moat Chrouk (Chau Doc) province in an attempt to set a border between Kampuchea and Kampuchea-Krom. Thousands of Khmer-Krom people were killed by a deliberate flooding of the area. The Khmer-Krom people who rebelled against Vietnamese authority were buried alive to the neck, their heads were used as a stand to support a tea kettle in an incident called, Don’t spill the masters tea (Kum pup te ong). During this time, the Khmer-Krom people also were forced to change their last names. The last names THACH, SON, KIEN, KIM, CHAU and DANH were forced upon the Khmer- Krom people in the designated provinces as an attempt to identify and control those who were of Khmer origin. For example, the CAO family name is mostly used for Khmer-Krom in Raung Domrey (Tay Ninh) province, DAO family name in Prek Reussey (Can Tho) province, CHAU (for men) and NEANG (for women) family name in Moth Chrouk (Chau Doc) province, DANH family name in Kramoun Sor (Rach Gia) province, THACH, KIM, SON, KIEN, family name in the provinces of Preah Trapeang (Tra Vinh), Kleang (Soc Trang), Pol Leav (Bac Lieu), and Tuek Khmau (Ca Mau). However, some last names are mixed such as: Ly, Diep, Lam, Tang, Nhan, Huynh, Tran, Ngo, To, Duong, Luu, etc..
Internal conflicts continued to occur as the Khmer-Krom peasants tried to defend their remaining land. In addition to Emperor Gia Long installed Governors, the Khmer-Krom Governors were coexisting in areas heavily populated by the Khmer-Krom people. In 1832, Le Van Duyet, who governed Prey Nokor area and also controlled the Panduranga-Champa (Phan Rang), died. Emperor Minh Mang used to contend with Le Van Duyet, but he could not do anything to him because he had helped the Nguyen Dynasty win the war against Tay Son. Emperor Minh Mang sent forces to capture Panduranga and killed whoever did not obey him. It was a historical year, in that the Champa Kingdom was completely erased from the Indochina map. In 1856, King Ang Duong secretly contacted the French Emperor Napoleon III through a French Catholic Missionary, Monseigneur Miche, in France in an attempt to reclaim the lost provinces of Kampuchea-Krom and sought protection for Cambodia against aggressive neighbors. His request was not fulfilled until 1858. In 1858, after bombardment of Da Nang to revenge Emperor Tu Duc executing the Catholic missionaries, Admiral Doudard De La Grandiere sailed to the South to follow up the request of King Ang Duong in 1856 as ordered by French Emperor Napoleon III. With the help of King Ang Duong’s Royal Army, the French successful captured Prey Nokor in 1859. Following the liberation, the French took over Prey Nokor and renamed it to Sai Gon. 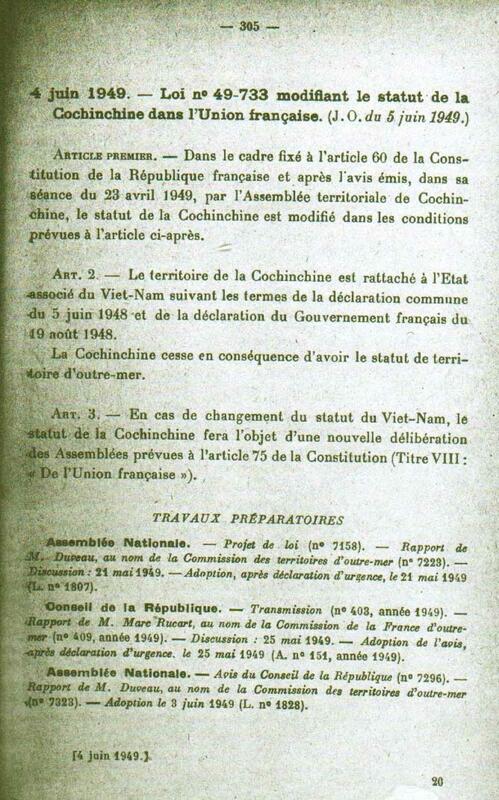 France extended their occupation to Chongva Tropeang (Bien Hoa), Preah Sourkea (Ba Ria). In 1859, the Khmer-Krom in Khleang province stood up under the leadership of Sena Sous to battle against the Vietnamese invaders at Mahatup and Chong Ballang. During three years of revolution in this province, the Khmer-Krom liberated most of the areas in Khleang province and surrounding areas. Unfortunately, Sena Sous was poisoned by the Vietnamese secret agent. In the same year, King Ang Duong died and his oldest son, Ang Vettey succeeded him as King Norodom. In 1860, Sena Mon’s and Sena Tea’s led Khmer-Krom to stand up against the Vietnamese at Lum Pou Yea (Thanh Phu), Khleang province. Sena Tea was wounded during the fighting and died later. His body was buried in the Kveng Krobel (Hung Oh) Buddhist temple in Pol Leav (Bac Lieu) province. In 1884, Tonkin (North Vietnam) and Annam (the center of Vietnam) became French protectorates. In 1887, Cochin China, Cambodia, Tonkin, and Annam were politically grouped into a confederacy called the Union of French Indochina (Laos was added in 1893). The capital of French Indochina was moved from Saigon to Hanoi in 1902. Cochin China was administered by the French because it was considered a French Colony instead of a protectorate that was administered by the native rulers. During the French colonization of Kampuchea-Krom, the Khmer-Krom people entered a temporary period of stability and peace amongst millions of Vietnamese settlers. Recognized as people related to and/or descendants of Cambodia, the Khmer-Krom people had the same rights as a Khmer citizen would if they were in the Motherland. With basic rights and fundamental freedoms, the Khmer-Krom culture and identity flourished with many of their people getting greater access within the educational system, which at one point was only available for Vietnamese people. This allowed them to take part in local government and hold government positions within the provinces of Cochin China. • The Viet Minh arrested hundreds of Khmer-Krom and placed them into pillories, drowning them in Kampong Toteung River in Preah Trapeang and also other villages of Dam Kinh, Dam Gioi, Ho Phong, Gia Rai, Koh Mahat, Phno Andet in Khleang, Pol Leav, and Teuk Khmau provinces. • In Pol Leav (Bac Lieu) and Khleang (Soc Trang), the Khmer-Krom leaders and intellectuals were gathered into the Japanese rice granaries, locked up, and set afire in an attempt to destroy Khmer-Krom identity. • In Moth Chrouk (Chau Doc) province, during the night time, the Viet Minh troops came to the Khmer-Krom villages and started fires to burn the Khmer-Krom’s houses. The Khmer-Krom stood up to defend their villages and this led to fighting among Khmer-Krom and the Viet Minh. In 1949, to prevent the ambitious expansion of the Communist regime toward the South and in hope of preserving essential privileges, the French government persuaded Bao Dai to return from exile with the promise of being promoted the Head of State of Vietnam. On March 8, 1949, the Elysee Agreement was signed between the French President Vincent Auriol and New Associated State of Vietnam in which Bao Dai was recognized as the leader without prior consultation of the Cambodian King. Alarmed by changing status of Cochin China, a Cambodian delegation composing of H.E. Son Sann and Prime Minister Mr. Chhean Vam was sent to Paris to protest against this transfer. The debate concerning that decision followed. With the help of a group of French Representatives led by Mr. Gaston Deferre (Mr. Juglas, Abelin, Bourgnes, Maunoury, Duveau, Dumas, Rene, Pleven, and Mr.Temple), Cambodian government sent a delegation composed of H.E. Son Sann and Mr.Chhean Vam to France to protest against that transference. With this situation, a group of French Representatives led by Mr. Gaston Deferre presented a motion demanding that the French Government solve all pending questions between the protectorate of Cambodia and the colony of Cochin China before yielding that colony to Vietnam. On June 4th 1949, the French President, Vincent Auriol, signed the law granting Cochin-China to the Bao Dai government without prior or proper consultation with the indigenous Khmer-Krom. On August 29, 1956, the Diem regime issued an ordinance to Vietnamize the Khmer-Krom. The Khmer-Krom people were forced to change their names to Vietnamese sounding names in order to go to school or apply for a job. The Khmer-Krom’s race was also changed in their identity card from Cambodian to Vietnamese. The Khmer-Krom people were called as “Người Việt Góc Miên” (The Vietnamese of Khmer Origin) in government documents. During this time, most of the farmers in Kampuchea-Krom were Khmer-Krom because they had lands to farm. The Diem regime wanted to take away Khmer-Krom’s farmlands to distribute to the Vietnamese newcomers (mostly from the North after 1954) in Kampuchea-Krom. The Diem regime implemented a strategy to legally confiscate the Khmer-Krom’s farmlands, called “Cải Cách Điền Địa” (Farmland Reform). With this farmland reform, the Khmer-Krom lost thousands of hectares of farmlands to the Vietnamese. At the end of 1957, all the public schools that taught in Franco-Khmer were closed. The Khmer-Krom students were forced to learn only Vietnamese in public schools. However, the Khmer schools still opened in the Pagodas teaching by the Khmer-Krom Buddhist monks. Lots of Khmer-Krom dropped out of the public schools. They could not continue their education because they did not know Vietnamese. Some fortunate Khmer-Krom families could afford to send their children to continue their education in Cambodia. On October 16, 1958, The “Free Khmer” (Khmer Serei) movement was found and led by Dr. Son Ngoc Thanh at Phum Thom (Loc ninh) village, Neak Kiri (Binh Long) province (which used to belong to Toul Ta Mouk province). In 1959, the Khmer Con Sen Sar (Khmer White Scarves) movement was formed by the Khmer-Krom in Svaiton (Tri Ton) district, Mouth Chrouk (Chau Doc) province and led by Kru Samouk Seng, Kru Kong, and other commanders like Chau Im, Chau Reap, etc. On March 18, 1960, the “RONASSE TOSU Kampuchea-Krom” (Front for the Struggle of the Kampuchea-Krom) was formed at Phnom Po peal (Cam Mountain), in Kro Bao (Tinh Bien) district and led by Chau Dara. The Khmer Con Sen Sar members merged into this movement. On November 1, 1963, the South Vietnamese Generals, led by General Duong Van Minh, made a Coup D’état to overthrow Diem regime. Both President Ngo Dinh Diem and his brother, Ngo Dinh Nhu, were killed on November 2, 1963. After the Diem regime collapsed, the Khmer-Krom prisoners that were imprisoned by the Diem regime were released. The US government started sending more American troops and special advisors into South Vietnam to help the Republic of Vietnam government to prevent the VC’s expansion into Kampuchea-Krom. The Khmer-Krom people were allowed to run for the local government positions in the area where Khmer-Krom populated. They were also allowed to freely practice their Theravada Buddhism with their own Buddhist Association. In 1965, when the US actively conducted the war against the NFL and also helped bring the democracy to the South Vietnam, the Khmer-Krom community started realizing who their real enemy was. Thus, all the members of the Front for the Struggle of the Kampuchea-Krom joined the US Mike Force receiving salary directly from the US government, not from the Republic of Vietnam government. Thousands of Khmer-Krom youths joined US Special Forces to fight the VC. On October 8, 1969, the National Assembly of the Republic of Vietnam led by President Nguyen Van Thieu denied the draft of a minority ethnic council to recognize Khmer-Krom as an ethnic minority instead of considering them as Vietnamese. On November 13, 1969, the unjust denial to recognize the rights of the Khmer-Krom led to many demonstrations by the Khmer-Krom and Khmer-Krom Buddhist monks in Prey Nokor (Sai Gon) and throughout Kampuchea-Krom. On March 26, 1970, President Nguyen Van Thieu signed an ordinance, called “Người Cày Có Ruộng” (LAND TO THE TILLER). This policy took away thousands of hectares of farmland from Khmer-Krom to redistribute to the Vietnamese. Even the Vietnamese government paid some compensation, but it was not worth the current market price. From 1970 – 1972, thousands of Khmer-Krom soldiers were sent to Cambodia by the US to help Lon Nol regime to fight the communists in Cambodia. Unfortunately, most of those soldiers sacrificed their lives to defend the sovereignty of their fatherland, Cambodia. On May 13, 1975, the VC government ordered the dissolution of the Khmer-Krom Theravada Buddhist Association, Khmera Nikay Association. The leaders of all the Khmer-Krom Buddhist Associations, the leaders of the local Khmer-Krom temples, and thousands of the Khmer-Krom people (soldiers, police, government workers, translators, etc.) who worked for the old regime (Republic of Vietnam) were sent to prisons called “Reeducation Camps”. Hundreds of them died in the prisons because of torture, starvation, sickness, etc. On June 19, 1975, the VC government arrested Son Ngoc Thanh and imprisoned him in Chi Hoa prison in Prey Nokor. He died in the prison in July 8, 1977. The VC government also sent the family of the Khmer-Krom who worked for the old regime to live in the “Vùng Kinh Tế Mới” (New Economic Zones) as revenge. These are the areas that were under development, with no irrigation systems, no sanitation, no schools for their children, and with limited access to basic supplies of foods and medicines. The VC government implemented a strategy, called “Đánh Đổ Tư Sản” (Subversive capitalists), to “legally” take away the property of the wealthy Khmer-Krom families. The VC government ordered the closing of all the Khmer schools and forbade the teaching of Khmer in public schools and in the Khmer-Krom temples. The VC government sent millions of Vietnamese from the North to live in Kampuchea-Krom. These people were the newcomers so they did not have land to farm. To “legally” help the Vietnamese newcomers in Kampuchea-Krom, the VC government started implementing its communist land reform policy, called “Tập Đòan”. The VC government declared that all the farmlands in Vietnam belonged to the government, so the VC government had the right to distribute all the farmland equally to all the farmers based on their head count in each family. With this tactic, the VC government took all the farmlands of the Khmer-Krom and redistributed them to the Vietnamese without any compensation. This was the main reason that made the Khmer-Krom have almost completely lost their farmlands to the Vietnamese. On April 18, 1978, the VC government claimed that the Khmer Rouge came to Ba Chuc village, Tri Ton district, An Giang province, and killed more than 3000 innocent Vietnamese citizens. However Nguyen Vinh Long Ho (http://vantuyen.net/index.php?view=story&subjectid=26212), he believed that it was a framed incident by the VC government to revenge the “Hòa Hảo” (also known as “Tứ Hiếu”) religious followers who did not support NFL during the Vietnam War. To cover up their crime, the VC government blamed this mass killing of innocent Vietnamese people on Pol Pot. The VC government also used this incident to propagandize that the Khmer Rouge regime encroached on Vietnamese territory and used it as the reason to invade (the VC government called it “a mission to liberate Cambodia”) Cambodia. After the Ba Chuc incident and while preparing to invade Cambodia, the VC government claimed that the Khmer Rouge could come out of hiding in the Khmer-Krom villages in the Moth Chrouk (Chau Doc) province. It was not easy to recognize who Khmer Rouge or Khmer-Krom were because they both were Khmer. With that propaganda, by the end of 1978, the VC government had forcefully evacuated the Khmer-Krom from the entire Moth Chrouk province to live in the “New Economic Zone” in Khleang (Soc Trang) leaving behind all their belongings, properties, livestock, farmlands, and especially their beloved temples. On December 25, 1978, the armed forces of Vietnam started invading Cambodia. The Vietnamese forces completely controlled Cambodia and declared the victory on January 7, 1979. The VC government installed a Vietnamese client government led by puppet Cambodians to govern Cambodia. The invasion of the Vietnamese occurred in less than two weeks that made lots of people wonder why the Khmer Rouge forces defeated so fast. Were Vietnam troops already hidden in the Khmer Rouge army? Since 1979, thousands of Khmer-Krom escaped their beloved homeland to seek refuge in other countries because they could not live under the oppression of the VC government. By the end of 1980, the VC government started allowing Khmer-Krom people of Moth Chrouk province who were living in Khleang to go back to their villages without any transportation assistance from the VC government. Just from Khleang to Moth Chrouk, some Khmer-Krom families could not find money enough to go back to their villages and stayed in Khleang until 1982. When the Khmer-Krom went back to their villages, their houses and farmlands were confiscated. This evacuation tactic caused thousands of Khmer-Krom families in Moth Chrouk to live in poverty even today. In 1982, the Vietnamese Communist government started implementing the KC50 affair to arrest and kill Khmer-Krom patriots in Preah Trapeang (Tra Vinh) province. The “K” stands for “Khmer”, “C” stands for “Chết” (means “die”). The KC50 was known as “Make 50% Khmer-Krom die or Kill 50% Khmer-Krom”. From 1982 – 1985, thousands of Khmer-Krom and Khmer-Krom Buddhist monks were arrested, imprisoned, tortured, and killed in prison. The VC government even arrested the Khmer-Krom who used to support them during the Vietnam War. One of the well-known and most respected Khmer-Krom Buddhist monks was Venerable Kim Toc Chon who was the Me-Kon (the Chief Monk) of the entire Preah Trapeang province. Hundreds of Khmer-Krom had to escape to Cambodia. Some of them were fortunately emigrated to the US and other countries. In 1985, the Khmer-Krom abroad organized the First World Convention on Khmer-Krom in New York City, USA. When the Khmer-Krom arrived in the western countries and started reporting this incident to the world, the VC government got scared so they set up a trial to find “justice” for the Khmer-Krom victims on September 12 and 13, 1990. According to the Vietnamese Court’s judgment (02/SCT 13/9/90), there were only “195 people arrested, 4 people committed suicide, and 11 people deaths”. The irony of this judgment was that none of the Vietnamese authorities who actually conducted the arrests and ordered the torture of Khmer-Krom in the prison was sentenced to prison. In 1996, the Khmers Kampuchea-Krom Federation (KKF) was named during the Fifth World Convention of Khmer-Krom abroad in Toronto, Canada. The KKF opens a new chapter for the Khmer-Krom struggling to seek justice using non-violence for the unfortunate Khmer-Krom in Kampuchea-Krom, especially the right to Self-Determination.